Worried by the spate of building collapses in the state, Governor Willie Obiano of Anambra State has opened what is widely believed to be the first Building and Construction Materials Quality Control Laboratory in Nigeria. In a brief ceremony at the weekend to mark the commissioning of the ultra-modern facility sited in the premises of the Ministry of Works, Awka, the governor expressed hope that with this interventionist effort, the saga of building collapses in the state would soon be consigned to the past. 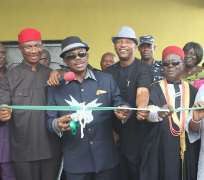 According to him, the facility, which has over 120 equipment for testing various materials to ensure a comprehensive compliance to standards, Chief Obiano observed that with the facility, the incidence of structural failures which lead to the collapse of buildings, road and other infrastructures would come to an end in Anambra State. The governor however warned that any builder or construction engineer who fails to submit his materials for testing in the laboratory runs the risk of having his building or any project under construction pulled down by the relevant authorities as his administration would no longer fold its hands and watch citizens die on account of someone's carelessness. The governor also ordered the immediate removal of all structures leaning on approved original building plans and made it clear that very soon, when the relevant authorities embark on the dismantling of such structures, it would be accompanied by severe penalties ranging from outright prosecution to the payment of heavy fines including the eventual cost of dismantling them by the authorities. He also enjoined builders to maintain the specified set-back from road as government would not hesitate to demolish any structure sited on a set-back. Earlier in his opening remarks, the Commissioner for Works, Hon. Callistus Ilozumba said the laboratory would be managed through a public-private partnership arrangement between the State government and a private firm. Hon. Ilozumba further explained that in accordance with specification, construction materials would be pre-tested before they get to the project sites and quality control test conducted while the projects are in progress. He called on all the stakeholders to continue to give support towards the realization of the goal of the project. In his own remarks on behalf of public-private partners, Mr. Ebosie Ezeoke disclosed that the laboratory would provide service for testing sub-soil, soil, concrete, steel, chemical, asphalt and non-destructive test for existing structures. Also speaking, the Secretary to the Investigation Panel on Collapsed Building, Mr. Emeka Okpala said the Panel was already using the facility to carry out their work on collapsed building.